Most people don’t know Brian Helfrich once dabbled in the fine art of ceramics, but it’s true. Brian is the Vice President of Construction at Aquascape and what most people DO know is that Brian possesses highly superior pond-building skills. Part of his artistic ability comes from observing the work of his peers, whether it be Mother Nature herself or the likes of B.J. Linger of BJL Aquascapes in Oceanport, NJ. For those who’ve witnessed the aesthetic precision of the slate work that lines the inside of the Aquascape grotto, you’ve seen the handiwork of B.J. Linger and others. 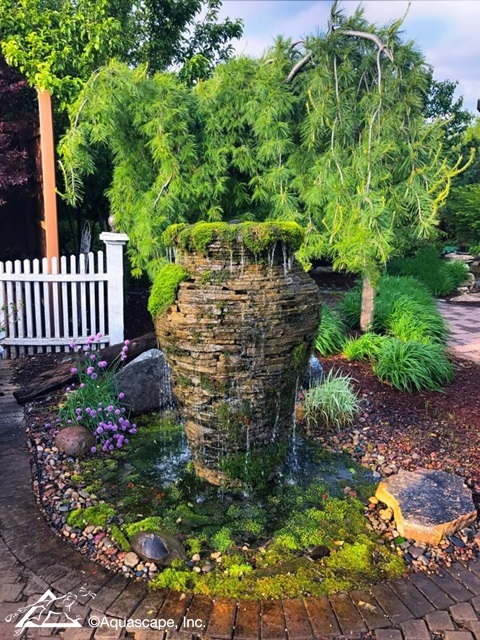 A love of ceramics and an admiration for the work of fellow contractor Linger, Helfrich was moved to create the stunning intricacy of the slate urn that graces the entrance of the AquaGardens located at the west end of Aqualand. Brian first saw Linger’s slate work in a waterfall he constructed. 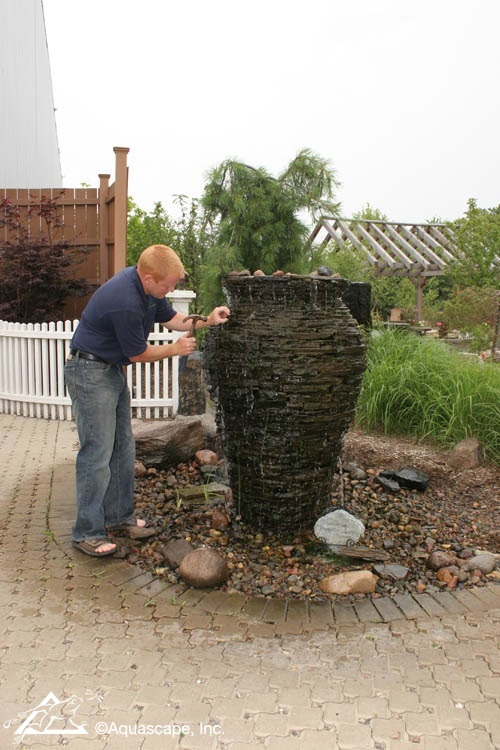 Brian racked his brain thinking of different applications where this type of artistry could be used, and his propensity for ceramics led him to create the piecemeal slate urn for the AquaGardens. Brian visualized water bubbling from the top of the urn and cascading over each individual piece of stone. In Brian’s mind’s eye, the urn would be small yet captivating. However, one thing led to another and an overly ambitious Helfrich soon found his urn getting taller and taller. Brian painstakingly worked little by little on the urn, building his way two-thirds up from the bottom, at which point he grew quite tired of the project. One day his inspiration, B.J. Linger, showed up and was inspired to finish the urn for Brian. Linger finished the top quarter of the urn late into the evening and found himself eyeball to eyeball with John Law at about 1:00 a.m. The police officer thought a vandal was on-site. After some delicate explanation, Linger was not handcuffed and went his merry way. Not only is the AquaGardens urn beautiful, but it’s practical as well. Brian and his crew like to use New York Blue Stone in their waterfall projects, but the stone has to be “chunked off” and the remnants of stone are sometimes discarded. Brian now recycles the smaller chunks of stone and uses them for urn projects. Helfrich has since finished a couple more of the slate urns. One is on display at Wasco Nursery in St. Charles after making its first appearance at the Chicago Flower & Garden Show. The slate urn was a hit at the show and appeared on the cover of the Tempo section in the Chicago Tribune. The urn was then lovingly transferred to its permanent home in Wasco, where it continues to draw attention and admiration from shoppers. A recent urn project using recycled stone took place at a private residence in nearby Batavia. It’s a squat urn – larger in circumference than the AquaGardens urn, but shorter in stature. The slate urn has a gray body with a brown top. The bubbling urn took 2 ½ days to complete with a crew of four and the final price tag was $8,700. Since a lot of people might find it challenging to afford such a luxury, Aquascape produced a low-cost, fiberglass replica of the feature. Aquascape now offers a small, medium, and large fiberglass stacked slate urn for a fraction of the cost of the real slate urn! As for Brian, he’s back on his pond-building beat doing what he does best. We’re sure more inspirational ideas will flow out of that red-haired head of his.